The inside of the Living Temple. Constantine Firespark praising the temple's consciousness. The ruined house where two bodies are found. This quest will begin automatically after the end of Interlude. Constantine Firespark will tell you to meet him and Jespar Dal'Varek in Fogville, to search for the Sigil Gem that can open the door to the Crystal Temple. After fighting your way through a few Arps, you'll encounter Jespar and Firespark, who complains that you took too long to arrive. He'll then head for the temple and leave you with Jespar to search for the gem. Jespar will suggest that you search the Town Hall first. Be careful as you enter the Town Hall. Two Arps are waiting for you inside, and the place is heavily booby-trapped. At the top of the stairs on the main hall, a charged Petty Soul Gem will cast Lightning on you continuously, and a spiked ball will come down swinging on you if you try to disable it. The key to the door blocking your path can be found on the Arp Shaman that you just killed. Behind it, you will find a trap door to the cellar. You'll find a safe on the cellar, which you'll have to lockpick. There are a few lockpicks on the table to the east of the safe. Inside the safe you'll find a Sigil Gem of the Crystal Temple. Return to Jespar and tell him you're ready, then head to the quest marker to find the Crystal Temple. You can fast-travel to the Myrad Tower near the Frostcliff Tavern to get there faster. When you arrive on the Crystal Forest, you'll have to talk with Jespar. You can get one knowledge point, about the Living Temple, in this dialogue. As you near the Temple, Firespark will greet you and explain that there is a consciousness bound to the temple, a consciousness that probably belongs to a Pyrean priest. Interact with the marked socket to put the gem in it, and a magical bridge will form on the temple's entrance. You can now enter the Crystal Temple. Be careful, as the inside of the temple contains many Lost Ones, including a giant Grotesque Lost One and the Lord of the Lost Ones. After you make your way through the undead, you'll come across a trisection, with three paths: The Wise Man, The Warrior, and The Dark One. Firespark heads to The Wise Man, and Jespar heads to The Warrior, leaving you with The Dark One. Step on the pressure plate to the east and enter the door to face your trial. The lever facing North controls the door to the West. The lever facing West controls the door to the South. The lever facing East controls the doors to the East and West. The lever facing South controls the doors to the South and West. You can take the paths to the East and to the West to disable the Soul Gems blasting you with lightning magic, but that is not required. When you're ready, head to the south path, where a few Wisps and an Ancestral Spirit guard the door to the next section. Following the light-marked path will lead you to a chest sitting on top of a fake floor to a spike pit, which leads to instant death. The chest only contains 10 Pennies. Head to the path on the west. You'll have to dodge a few swinging blades, which you can disable at the end of the path with a chain on the wall. Going further down, through the broken stairwell, will lead you to Jespar, who asks if you have met Firespark yet. Just after asking, whoever, both of you hear Firespark's voice through the metal door. Open the door and you will find Firespark. 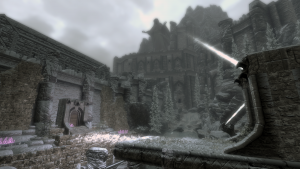 Apparently, the consciousness in the Temple has shown him the truth, about the Enderal:High Ones, about The Cycle, and about the Enderal:Emissaries. That, however, has driven him crazy, and you'll be forced to kill him to continue. Be prepared, as Firespark is a formidable opponent, using strong Elemental magic against you. After the battle, you can choose to have him buried properly, if you wish. Talk to Jespar and he'll open the door leading to the next area. You'll find yourself on top of a ledge in a big cavernous area where the sea flows into. 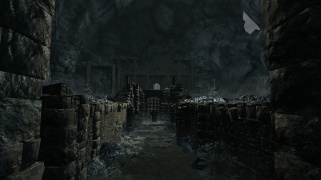 As you near the bottom of the cavern, Jespar will stop you and scout the ruined house ahead. After coming back, he will ask you a "trivia" question, then tell you to look inside the ruined house yourself. Go into the house, and you'll find two dead bodies: Sirius, and You. 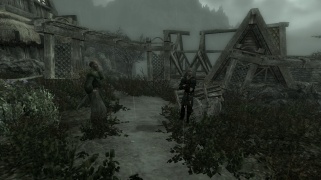 Talk with Jespar and keep following the ledges to go the next area. In the Living Temple's Lower Floors you'll find your destination: The Undertrain. Make your way through the two giant Grotesque Lost Ones to the engine wagon, and Jespar will ask you to find the four levers that activate the train. You can find the levers on the ruined path right across the train itself. Activating the levers will cause Lost Ones to spawn. Talk with Jespar and he'll tell you to take a seat inside the train. Follow the quest marker and sit on the train wagon. The train will start running, and Jespar will enter the wagon and sit down with you. As you wait to reach your destination, Jespar will tell you the story of his father, Damean Dal'Varek. Damean was a respected judge, who treated all those equally, regardless of status. When judging the son of a powerful and influential Sublime, who confessed his crimes outright, he refused to accept the threats of the boy's father, and was the only judge to condemn the boy. The father used his connections with the Rhalâta to have Damean and his family killed. Jespar and his Sister only survived because they were out of the house at the time. Jespar will then ask for your story as an orphan, which you can choose to share or not. After that, you'll both sleep until you reach your destination. This quest will end, and The Lion's Den will begin. Firespark and Jespar waiting for you in Fogville. The path of The Dark One. This quest's objectives have no difficulty rating, despite you having to face many tough and unique foes. If Jespar is gone after fast travelling between the Myrad Towers from Fogville to Frostcliff Tavern, you can enter and exit the tavern to make Jespar teleport to you. Objective 80: Challenge the "Path of the Dark One"
Objective 170: Wait on the bench in the train until Jespar got the train moving. Bad news - Endralean scouts sighted Nehrimese warships in front of the East Coast. The reason why the "Free Peoples of Nehrim" as the freshly reunited nation calls itself has invaded these lands is unknown, but Arantheal thinks that it has to do with their ideology. Taranor Coarek, the leader of the Free Peoples is a declared enemy of religion and knows that the Order is keeping the death of the Light-Born under wraps. Lishari also thinks that the Free Peoples know about the Cycle and the High Ones - but do not see them as a danger, unlike we do. In order to provide clarity Jespar, Constantine and I have to spy on the island on which they landed. To reach the island on which the Nehrimese build their camp unnoticed Constantine Firespark wants to use an old, Pyrean technology: The subway, a mechanical construction which connected the whole of the Pyrean empire through underground tunnels. He hopes that we can find a working one in the "Living Temple" - but to get inside of the temple we need a sigil stone. Constantine said that it should be located in the crumbled village Fogville. To reach the island on which the Nehrimese build their camp unnoticed Constantin Firespark wants to use an old, Pyrean technology: The subway, a mechanical construction which connected the whole of the Pyrean empire through underground tunnels. He hopes that we can find a working one in the "Living Temple" - but to get inside of the temple we need a sigil gem. And he was right - the sigil stone was in the town hall. Now Jespar and I have to travel to the Crystal Forest and meet up with Constantine there. To reach the island on which the Nehrimese build their camp unnoticed Constantine Firespark wants to use an old, Pyrean technology: The subway, a mechanical construction which connected the whole of the Pyrean empire through underground tunnels. He hopes that we can find a working one in the "Living Temple" - but to get inside of the temple we need a sigil stone. To reach the island on which the Nehrimese build their camp unnoticed Constantine Firespark wants to use an old, Pyrean technology: The subway, a mechanical construction which connected the whole of the Pyrean empire through underground tunnels. He hopes that we can find a working one in the "Living Temple". In the depths of the temple we reached a crossroad at which we had to split up. To reach the island on which the Nehrimese build their camp unnoticed Constantine Firespark wants to use an old, Pyrean technology: The subway, a mechanical construction which connected the whole of the Pyrean empire through underground tunnels. He hopes that we can find a working one in the "Living Temple". To reach the island on which the Nehrimese build their camp unnoticed Constantine Firespark wants to use an old, Pyrean technology: The subway, a mechanical construction which connected the whole of the Pyrean empire through underground tunnels. He hopes that we can find a working one in the "Living Temple". When we split up at a crossroad something happened to Constantine and he lost his mind - he appeared to be hysterical and spoke about "the Light" and "that he saw it". He then started to attack us - Jespar and I had no choice but to incapacitate him. This page was last modified on 24 December 2018, at 12:51.